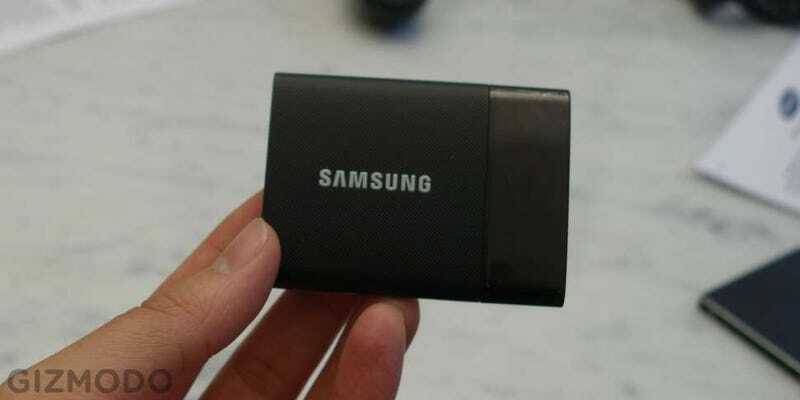 A terabyte in your pocket? There are a few options out there, even an absurdly expensive USB drive. But none of them are quite as slick as Samsung's newest portable SSD. And while its tiny little body tops out at 1TB for now, there are bigger sizes coming down the line. In that body you can get 250GB, 500GB, or 1TB of storage for the considerable price of $180, $300, or $600 respectively. Yeah, it's pricey, in part because it makes use of Samsung's V-NAND flash memory, a kind of 3D-stacked storage that allows for toooons of storage in a small space. In fact, Samsung says it could be fitting anywhere up to 16TB or so into this same body in a matter of years, the only real limiting factor is the price, which at that point gets absurdly sky-high. For now, you can purchase the more conventionally sized versions starting later this year. You know, if you really need all that storage in your pocket. Even if not, it's perfectly natural to just lust after it.